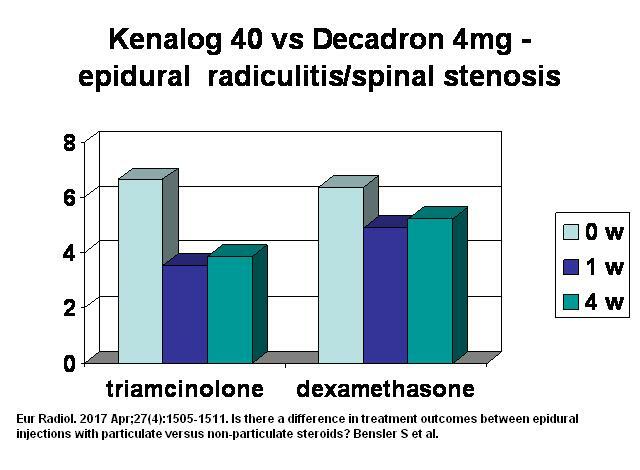 For Sciatica & spinal stenosis steroid epidurals are used but controversy exists over whether there is any benefit of particulate over soluble steroids. It would seem obvious that a steroid that last weeks would be better than one that last 6 hours. This study demonstrated just that. Eur Radiol. 2017 Apr;27(4):1505-1511. doi: 10.1007/s00330-016-4498-9. Is there a difference in treatment outcomes between epidural injections with particulate versus non-particulate steroids? Use CT guidance and dye injection to ensure placement which would go along way to ensure proper – there is a septum in lumbar region and dye may not make it to where it is needed. Sciatica Back Epidural or Caudal – 40 mg Steroid as Good as 80 mg.
one could use Midazolam shot – I give them caudally and they last over 1 month.